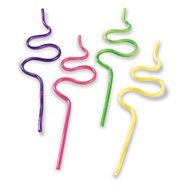 Happy National Drinking Straw Day! Every year, on January 3rd in the US, we celebrate the greatest invention since sliced bread. Actually, since the first modern drinking straw was invented back in 1888, it’s probably the greatest invention since the wheel! Since they were invented, drinking straws have evolved into something entirely different. The first drinking straw was made out of dry, hollow, rye grass, but was not adopted fully because it astonishingly made beverages taste like grass! As an alternative to this design, a man named Marvin Chester Stone wrapped a piece of cigarette paper around a pencil and coated it with wax so that it wouldn’t leak. Stone worked in a factory that made paper cigarette holders, so he had access to all of the materials he needed. So, on January 3rd, 1888, the modern drinking straw was born. It’s been exactly 124 years, and the drinking straw has changed in its appearance, design, and material makeup. Today, we have plastic straws, glass straws, steel straws, bendy straws, crazy straws, spoon straws, candy straws, mini straws, wide straws, cereal straws, color changing straws, and many more to choose from, all in different colors and sizes. And, to cater to today’s health-conscious citizens, some companies are even selling BPA and toxin-free straws! Essential Safe Products is one such company, which is currently selling stainless steel drink straws, as well as glass drinking straws that are good for the environment. For more information and environment-safe cooking products, visit LiveESP.com! As for today, please enjoy a beverage with a straw, and celebrate all that this great little invention has become in the past century. Happy National Drinking Straw Day! I wonder what kind of straw Marvin Stone would choose today? (taste).